For over two decades, Chopard has demonstrated an unfailing attachment to the world of classic cars in general, and to racing cars in particular. This passion is echoed in a range of classic yet sporty watch collections intended for elegant and sophisticated men with an extremely active lifestyle. Over the years, the Mille Miglia, Jacky Ickx and Grand Prix de Monaco Historique watches have become the brand’s best-sellers. These timepieces are grouped within the Classic Racing collection representing the culmination of all the technical and aesthetic innovations inspired by the field of automobiles. A star model in this new collection, the Classic Racing Superfast Chrono is an ultra-powerful chronograph with an imposing 45 mm-diameter case. 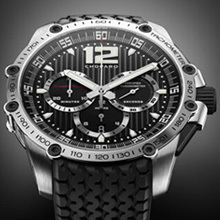 In 1988, Chopard became official timekeeper for the “Corsa più bella del mondo”, the Mille Miglia. Over the 1000-mile (1600 km) distance running from Brescia to Rome and back, enthusiasts from around the world compete with one other at the wheel of collector’s cars. In 1996, Chopard took part as official sponsor in the Mil Millas Sport, a classic car rally that takes place each year in Argentina. In 2002, brand co-president Karl-Friedrich Scheufele, discovered the Grand Prix de Monaco Historique through his friend and former Formula 1 racing driver Jacky Ickx, and immediately Chopard became official timekeeper for this event. From time to time, Chopard also supports the famous Rallye des Pharaons, the British Classic Cars meeting in St Moritz, the Old Timer Rally in Gstaad, or this year’s Schloss Dyck Classic Days. Over the last 20 years, Chopard has firmly established its credibility in the field of classic car racing. The full measure of sporting elegance and technical performances acquired throughout these two decades are now reflected in the Classic Racing Superfast Chrono in steel. Its “motor”, a mechanical self-winding chronograph movement with a 42-hour power reserve and COSC chronometer certification, drives the hour and minute functions, along with small seconds at 3 o’clock and an instant-jump date display through a window at 6 o’clock. The hour-markers are reminiscent of the markings on classic car dashboard instruments, such as rev counters and speedometers. 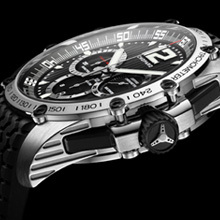 The chronograph function is operated by two pushbuttons at 2 and 4 o’clock controlling the central second hand, a 12-hour counter at 6 o’clock and a 30-minute counter at 9 o’clock. Finally, a tachometric scale engraved on the screw-down bezel further contributes to making this model the indispensable instrument for all those with a love of high speed and finely tuned mechanisms. In terms of its bodywork, the imposing 47.80 mm steel case is fitted with the famous rubber strap featuring the 1960s Dunlop Racing tyre-read motif. The rectangular integrated pushers are in black rubber-moulded stainless steel, as is the screw-lock crown reminiscent of a tyre and adorned with a metal appliqué bearing the Classic Racing collection steering-wheel emblem. The lines engraved in the steel sides of the case evoke the cooling fans found on the engine block of classic cars, and this motif is echoed on the dial.